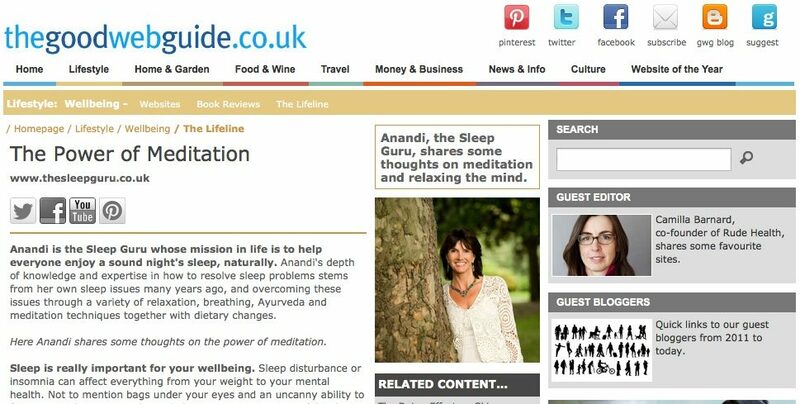 Here Anandi shares some thoughts on the power of meditation. Sleep is really important for your wellbeing. Sleep disturbance or insomnia can affect everything from your weight to your mental health. Not to mention bags under your eyes and an uncanny ability to forget everything! My goal is to help everyone to get a restful, relaxing night’s sleep and to wake feeling refreshed. 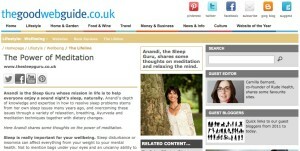 One thing that can really help with maintaining a healthy sleep rhythm is meditation. Meditation is a great way of relaxing the mind and calming that fight or flight response that many of us have for large portions of our days in modern life. Instances such as an irritating phone call, disagreement about who’s the best looking person in TOWIE etc, all build up and leave us in a constant state of stress that’s not great for getting seven hours’ sleep at night. Many people feel like they must be a complete meditation moron. A typical complaint I hear is that, “When I try to meditate, everything I need to do pops into my head.” This is perfectly normal and everyone experiences it when they first begin to meditate – it doesn’t mean you’re no good at it! The important thing is to stick at it and be patient. It’s important not to become disheartened; stick with it daily for at least three weeks and you will notice the benefits! Watch those shopping-list thoughts come into your mind, and float away again. Your to-do list will still be there when you finish!